Discussion in 'Forza Horizon 4' started by GTPNewsWire, Apr 11, 2019. 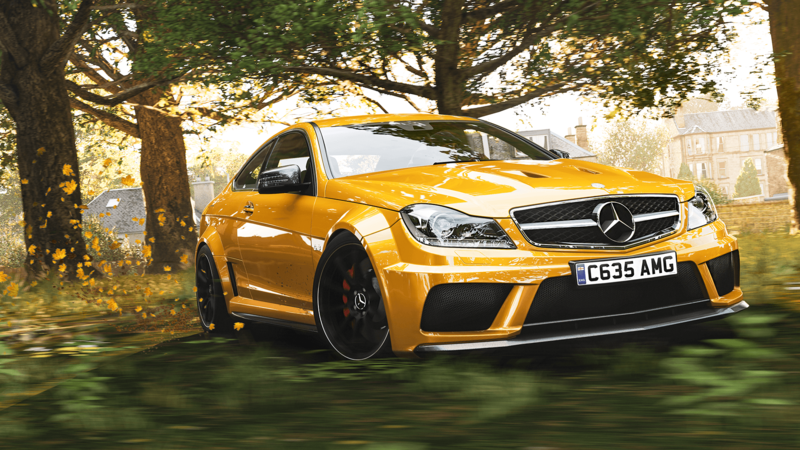 This article was published by Gary Slater (@AudiMan2011) on April 11th, 2019 in the Forza Horizon 4 category. The AMG GT 4 is sick. It's great that they put the brand new cars at 50% so you can get all of them within the first day the season starts. I already have the 80% cars so these seasons will be much less time consuming compared to the last cycle, which is nice. JoshMead and RazorSharkz like this. Can anyone give me a tip on how to hit 210mph on the Cotswolds speed trap cuz fxxxxx if I can, Buba. Agera RS best I could get was 194mph. Tried the Chiron problem is, it's even slower lmfao. Sorry 215mph. 210mph is not fast enough. Since you have the Agera you should have the car pass. Just get the Cooper Shelby Monaco and find a tune that state handling and speed. Drive around the Festival with your Agera so the drivatars will all get hypercars. Switch to the Shelby and approach the speedtrap from the Festival (downhill). Try to do it at sunrise since there seem to be less traffic during night. Rewind button is your best friend, so use it. Good luck. The X-Class is pretty uninspiring in stock form. I'll have to tune it up, see it there's more to it. In stock it's just boring. But tune it and becomes a beast. In S1 it's an Offroad Class killer. ^ Thanks for the tip, strela but these speed traps are quite frankly driving me insane. If it's not skidding off the track, it's crashing into 'perfectly' placed traffic or it's simply not going fast enough. This is not what I call enjoyable. I like a challenge but when it gets to the point you've been trying for hours but no cigar, you lose the will to live. I totally understand your frustrations Ryan. I hated the Drivatars in FH3 and even more here in FH4. They are just allover the place ramming every single traffic car. The only solution would be going Gold... or becoming really good at dodging. I don't know what else you could do in this case. When you go online there is just.... nothing. And even if you find a car you just ram him off the street than you rewind a little bit and the street is clear again since the traffic doesn't rewind with you like in offline mode. I used the F40 Competizione that I tuned for the speedtrap in the weekly challenge. I couldn't beat either in stock for but easily managed with a few x class upgrades. For the seasonal speed zone I required multiple passes with the Ferrari Superfast 812 at the height of its powers (X999 tune). The best approach was to begin my run from past the highway and uphill, not downhill from the windfarm. I also used the Superfast for the speed trap, this time uphill from the Festival (watch out for the first blind bend) and then downhill towards the trap. Good luck! To cut down on traffic cars, I always do the speed traps and speed zones in online mode. I used the Ferrari F40C for the speed trap near the Horizon Festival, and the Maserati MC12FE for the speedzone out near the windmills. I did like @Nacho Libre and went from east to west, uphill. The outright speed and downforce of the MC12FE was more than enough to get the prize. The F40C is sure something special, surprisingly civilized and great for cruising! I second that. X rank F40C is insane and enabled me to beat all the trap/zone challenges this week without much difficulty. Just max out everything with AWD and done; a car that can corner at 230MPH as if its travelling at half that speed. These weekly forzathon challenges are my favourite part of the playlist for this very reason. With so many cars in this game, its easy to overlook some real gems. I can't wait for next week's challenge either, I'm going to try and earn all million skill points in a single skill chain.